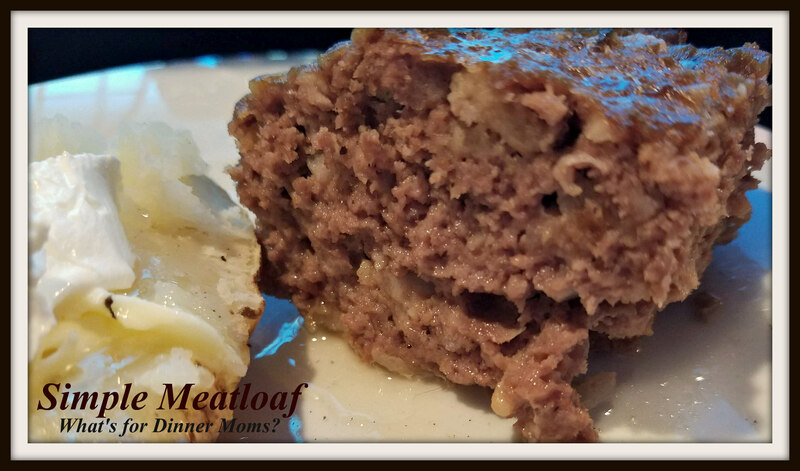 Basic Simple Meatloaf – What's for Dinner Moms? I don’t know why I don’t serve meatloaf more often. It is super simple to make – mix everything in a bowl and pat it into a loaf. You can make the loaves ahead of time and store in the refrigerator or freeze them until you are ready to bake it. An hour or so in the oven (add some potatoes for baked potatoes right in there) you have almost a complete meal. And if you are making one meatloaf why not make a second, to freeze, to thaw and freeze for later in the month. Paired with baked potatoes, broccoli, and a simple salad this was a delicious and comforting meal. I loved how simple it was to make and adding a second loaf when I was mixing this up means I have one in the freezer for a later date when things are super busy. Everyone was super happy with this meal. We all were home at the same time and talked all about what is going on in our lives. It was so nice to have everyone home together for a meal again. An easy dish to put together and you can make a second loaf to freeze for later in the month. In a large bowl, add the beef, bread crumbs, onion, milk, egg, Worcestershire sauce, parsley, salt, garlic powder, and pepper. Combine all ingredients until well blended. Add the meat mixture to a loaf pan until even. Make sure the pan in big enough to hold any grease that may cook out of the meat. Let the meatloaf rest for 5 minutes before serving.